Welcome to the July Kit! All about winter and all the lovely things that come with winter!! Simple Stories does winter so well with this snow lodge themed paper collection called "Sub-Zero". I'm in love with all the snow men, the actual snow lodge, the signs and plaques and all the extra little characters (play bear, moose and penguin! ) and all their snow equipment. 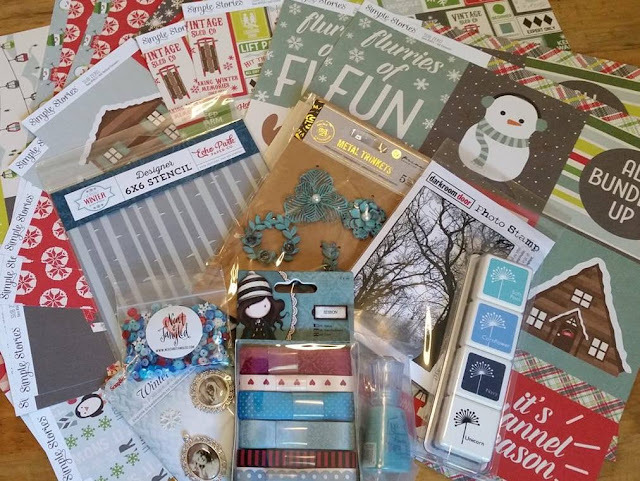 Lots of fun and opportunity for fussy cutting here! For our mixed media crafters, we have Shimmer Powder in the colour "Atlantic Burst" from Nuvo and a 6" x 6" stencil by Echo Park. For our stampers, a Hero Arts set of Winter ink cubes in a beautiful blue palette as well as a beautiful woodland silhouette stamp by Darkroom Door Stamps. Stay tuned for upcoming projects!